with this New Sample Prep Technique! FaPEx stands for "Fast Pesticide Extraction". It's a fast extraction/clean-up technique for pesticide residue analysis. FaPEx cartridges allow a 1mn extraction step that precedes the LC/MS/MS or GC/MS/MS analysis. 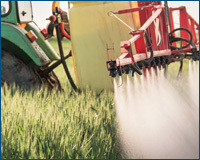 Pesticide residues in agricultural products are receiving ongoing and considerable attention from consumers. As global requirements for food safety are growing in numbers and complexity, safer, faster and more refined methods are needed to increase efficiency and overall capacity of pesticide residue testing laboratories. 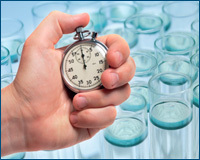 Sample preparation has most frequently been the rate-limiting step of analytic labs, and it is within this context that the FaPEx technology plays its full role. Currently, the fastest and most internationally recognized rapid extraction technique for pesticide residue analysis is the QuEChERS methodology (Quick, Easy, Cheap, Effective, Robust and Safe). It is an excellent alternative to more conventional and tedious methods that combine a first Liquid / Liquid Extraction (or LLE) followed by a second Solid Phase Extraction (or SPE). With overall enhancement in instrument performances (sensitivity, detection ability, resolving power, throughput, other performance attributes), sample preparation techniques had no choice but to keep up with these developments and follow the trend. The FaPEx methodology is based on the same principles than the QuEChERS method, while simplifying it to the extreme. FaPEx is the acronym for Fast Pesticide Extraction. It’s an innovative, simple and fast method for the preparation of samples, a crucial step preceding LC/MS/MS or GC/MS/MS analysis. 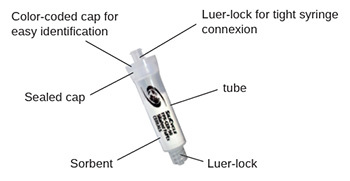 The FaPEx method relies on single-use pre-filled sealed cartridges. After homogenization, the sample is directly treated with a FaPEx cartridge. The resulting cleaned filtrate is ready for injection and chromatographic analysis. Because of its ease of use and great simplicity, FaPEx minimizes handling errors while providing high recovery yields. More than simply increasing yields of extraction, reducing time and costs associated with pesticide separation, FaPEx also scales down labor time, glassware requirements, specialized equipments and laboratory space requirement. It also significantly diminishes the amount of waste solvents and other chemicals. a liquid phase: the food matrix (fruits, vegetables, cereals, tobacco, etc.) and key analytes (pesticides). a stationary phase: the adsorbent (composed of various reagents, depending on the need). dewatering agents: dry the liquid phase and allow a better partition coefficient. PSA (primary scondary amine): removes sugars, fatty acids, organic acids, lipids, certain pigments. In combination with a C18 phase, also removes sterols and other types of lipids. C18: removes nonpolar organic compounds, saturated hydrocarbons and sterols. Carbon black: removes pigments, polyphenols, and other polar organic compounds. SiliaFast™ is SiliCycle’s brand for FaPEx® cartridges.